Cut cucumbers and daikons in half lengthwise, then cut into 1/4 inch slices and place in a large bowl. Add green onions, garlic, coconut sugar, salt, and ginger to cucumbers and daikon and toss to combine. Add fish sauce and Korean chili paste to bowl and mix with a large spoon (paste can be spicy) until well combined. Fill a measuring cup with water and Cutting Edge Culture and stir till well combined. If using kefir whey, add it on the next step. Fill 1/2 gallon jar or two quart jars with cucumber mixture leaving two inches at the top of jar for expansion. Add Cutting Edge Culture mixture to jar or jars evenly. (If using kefir whey, add it now). Fill jars with water, covering cucumber mixture but leaving two inches at the top for the veggies to expand and ferment. 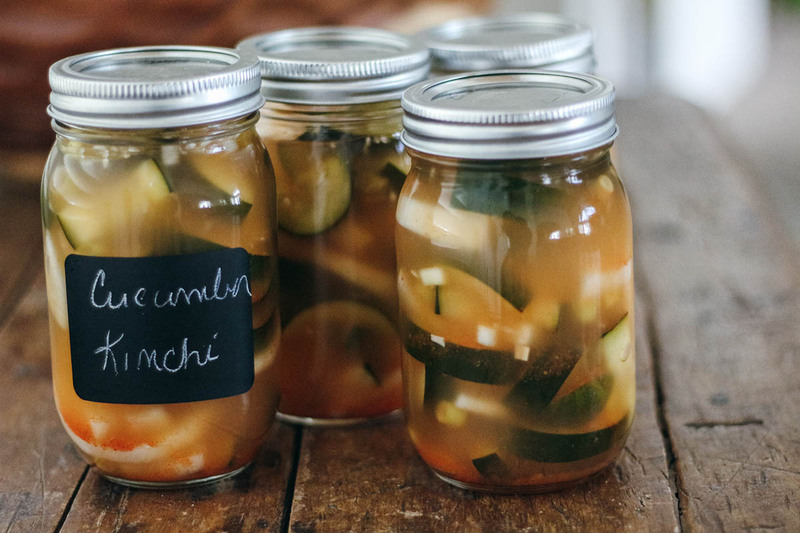 Ferment for 2 days at room temperature and then place in the refrigerator.